Any business activity relies on indicators for providing guidance in long-term. Indicators are important for business management, analysis and modelling. Therefore which indicators are selected and used or how data are collected need to be evaluated. An objective of the SKEMA project is to gather dispersed and unstructured information and to convert it into valuable knowledge. As part of this aim, the SKEMA Policy Index was proposed to structure the maritime policies of DG TREN in a form that facilitates the easy search of information. Our study ”Quality criteria and performance indicators” aimed to recommend a potential indicator set based on this Policy Index framework. This will assure the policy-makers that there is a clear link between policy objectives of the European Union and performance of an industry. Also it will assure the market agents that they are well prepared to anticipate any changes in EU transport policy. The EU policy is evolving with relatively huge implications for markets, companies and investors. National governments themselves become increasingly involved in EU policy proposal and design. EU policy objectives became targets for the internal market. Economic consequences from policies are being regularly analysed. And this process will move inwards still further. The study provides an extensive review of existing criteria and performance indicators relevant to the European maritime/logistics sector as a solid basis for the proposed indicator set. The introduction provides wider theoretical understanding of how to develop sustainable indicators. Further sections analyse the performance indicators of the supply-chain driven by efficiency and compatitiveness. The study also explores the capital markets’ criteria as socially responsible benchmarking in order to broaden the set of industry-led indicators. In addition, the study discusses briefly the statistical sources of information that will provide quantitative data. Finally, the report proposes a potential indicator set which will be developed further in future studies. 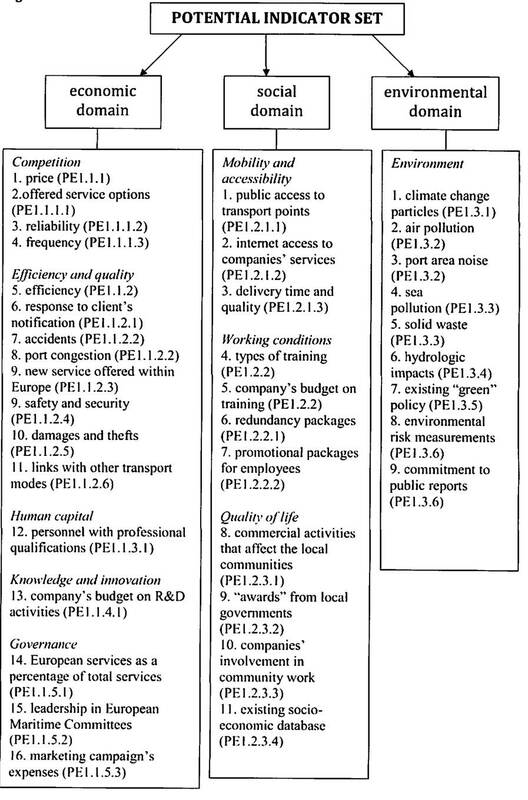 The proposed indicators are linked to the SKEMA Policy Index through the codes and clearly define the relation between policy objectives and an industry performance. Future studies could discuss the desired direction or quantitative levels of indicators.